I really like the idea of reading a great story that shares the true spirit of Christmas with my family. If you think you would enjoy something like that to, this is the giveaway for you to enter. 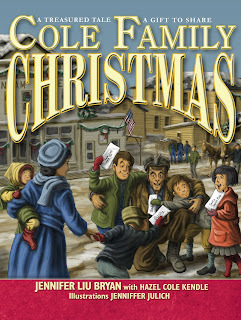 Cole Family Christmas is a book based off a true story. It's a story that was shared with the author (Jennifer) by her Grandmother-in-law (Hazel). Jennifer thought it was such a great story and wanted to preserve it and share the story with everyone. The entire family pitched in and helped with everything from research to design and now this beautiful story is available for all to share. Hazel was one of nine Cole children raised in the small mining community of Benham, Kentucky, in the Appalachian Mountains. The tale, based on a true story, follows a special Christmas when the Cole children are allowed to ask Santa for gifts from the Sears catalogue wish book. An unlikely snowstorm, however, sets the stage for a holiday in which gifts are given and received that no one could have predicted. The joyful and unexpected Christmas morning that results has lived on as family lore, and is preserved in Cole Family Christmas. You will love sharing this book with your family! If you'd like to learn more you can go to the Cole Family website. Also, the famous goat, Hilda, from the book is the mascot for ReadAloud.org. Have fun checking those out! Now, to enter for this GREAT family book, just see the official rules for the contest and then leave a comment below. I subcribe to your blog! What a wonderful sounding story, please enter me. I subscribe to your blog!!! Wow- what a cute blog! I got you off of your welcome comment at blog moms! I have been trying to get my signature at the bottom of my posts and can't! How did you do it? Yeah for the 12 days of Christmas!!! this book looks perfect to join my christmas collection! Have a great weekend, I gave you a shout out on our blog! Oh this sounds like an loving and joyful christmas story to read to the family! I would love to win it! I've got a post up about your contest...and the button in my sidebar!! And this book sounds great! I subscribe to your blog and have your link on mine. Please enter me into the contest. This sounds like a wonderful book. I would love to win this book! Thank you for the chance! I'd love to enter! I have a post on my blog about your contests & your button up too! My little loves to be read to! We would love this story. I posted about your blog and I added the button. We get a new Christmas book for our kids every year, this would be a wonderful to add to our collection. i'm kind of obsessed with books! i would love this! sounds like a great book. ps--i love the bird in your title. I would really like to have a copy of this book! I would love to have a copy of this book; it sounds great and all over the web! Sounds like a fun loving family read! I would love to win! Thanks for the chance! sounds like an interesting read. please count me in to the giveaway. i love to read, to my kiddies and the cherubs i teach. This looks like a fabulous book- would love to share it with my family. My son's name is Cole, so what a great gift this would be for our family. I would love to read this to my girls.. I am a book nut...I would love this!